After the Paris terrorist attacks I didn’t feel like making art. How can I make a difference? People all over the world are fearing for their safety and lives, and there I was in my nice apartment stumped about what my art should be. I began writing. I had a stack of blue post-its nearby. In a stream of consciousness style, I punched out my thoughts on my Smith-Corona typewriter. The power that the typewriter grants is self-evident: the immediacy, sound, and permanence of a physical action. It feels different on a typewriter. 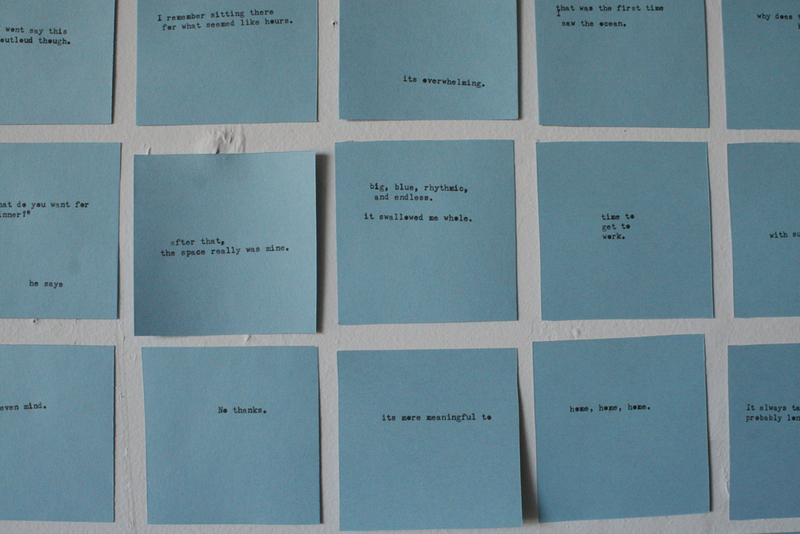 Charged with restlessness, I wrote on hundreds of post-its. After I ran out, I decided to be more specific, intentional and meaningful. I searched for sky-blue colored post-its; it turns out they don’t exist. I bought a stack of perfectly sky blue paper and began making my own post-its, cutting each 3”x3” square by hand, a blessing for my searching hands. When arranged in a grid, the blue squares resemble the size and expanse of a landscape painting. The grid was done by hand, with accidental wavered lines of negative space. The function of the post-it is to signify, to briefly give attention to and to remember: temporary importance. The form of the post-it gave me permission to let my voice be temporarily important. This was the first time I allowed myself to confidently let my writing be the art. As I placed them on my studio wall, they became larger and consuming; half were affirmations, good things, and the other half were anxieties. Writing is healing. Like myself, the world needs healing, too. I filled my pocket with a handful of the post-it notes and walked my usual route, stopping at coffee shops, bus stops, the post office, telephone poles, and little libraries. I placed the post-its in these public spaces not to receive a response, but to insert myself into a space that holds much more than me.